A Conquered Foe Returns To War-Torn Syria: Polio Already at war for more almost three years, Syria is facing another scourge. At least a dozen cases of polio have been confirmed so far, and experts fear the childhood disease could quickly engulf the entire country and spread beyond its borders. In a refugee camp in eastern Lebanon, aid workers put sandbags around plastic tents to keep winter rains from flooding dirt floors. For weeks now, the threat for Syrian refugees was the coming cold. Now refugees have a bigger fear: polio. A childhood disease that causes paralysis and sometimes death, polio can spread rapidly, especially with the huge movement of people fleeing the war. Some 4,000 Syrians still cross into neighboring countries every day, at least half of them children. Lebanon hasn't had a polio outbreak in 12 years. The announcement of 10 confirmed cases in eastern Syria is a wake-up call for the region, one that requires a regional response by health workers and aid agencies, says Dr. Foaud Foaud, professor of health services at Amerian University Beirut. "I think it's not about just 'fast enough,' they should be 'wide enough,'" Foaud says as Syrian refugees stream into neighboring Turkey, Iraq, Jordan and Lebanon. "They have to reach now five countries ... It's not easy at all. it's very difficult, but it's a must, now." In Lebanon, health officials are sending out 5,000 workers for door-to-door immunizations. This weekend, a center is opening at the airport and at the border to immunize young children as they arrive. In Syria, the government launched an immunization campaign as soon as the first polio cases were reported. UNICEF, the United Nations Children's Fund, is a key agency supporting the immunization program. UNICEF organized a vaccine airlift that arrived in Beirut and will be trucked into Syria. An immediate focus is the eastern Syrian city of Deir Ezzor, where the outbreak was first reported, says Juliette Touma, regional spokesperson for UNICEF. "In the past few days we managed to reach, at UNICEF, with partners, more than 40,000 children in Deir Ezzor, where the polio cases were confirmed," Touma says. "This is only the beginning." The goal is to reach 1.6 million children across Syria, an enormous challenge in wartime, she says. To reach the most vulnerable children, aid agencies have to negotiate not just with the government, but with rebel groups, to allow them to work in areas they hold or surround. "The challenges are huge," says Touma. "Our staff has to cross sometimes over 50 check points. It's a huge risk to reach people in need." Rebels present another challenge: Some are foreign fighters. Health officials strongly suspect that the virus that infected Syrian children could have come from Pakistan, Foaud says. That's a tragedy, he says; polio was eradicated in Syria 14 years ago. 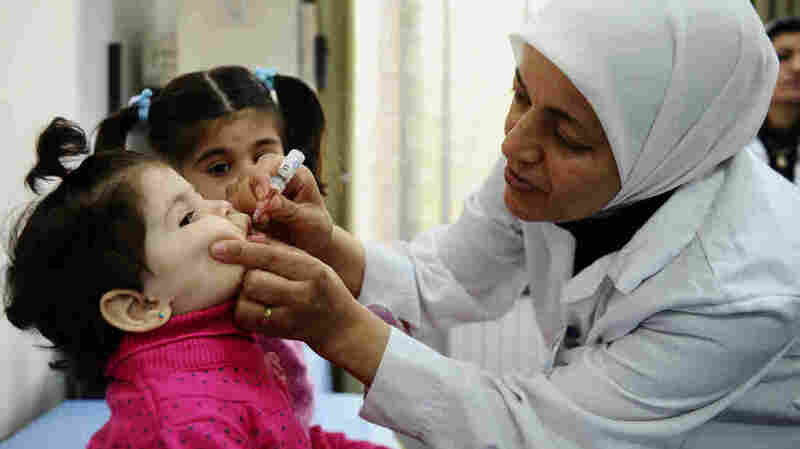 Syria was the first country in the Arab world to introduce mass immunization. "So we are facing now strange people fighting in Syria," Foaud says. "We're seeing strange diseases that we thought were finished. It means now, it's a collapsed system. So, no one wants to say it's a failed state, but at least in some part, it is."